A couple plotting a thrill kill encounters relationship trouble when one of them unexpectedly has second thoughts. Jennifer buys a new video camera to document the preparation and planning with her husband Farhang to thrill kill a random person. The couple purchases equipment from a hardware store, researches murder methods, and scopes out potential targets. Jen meets homeless man Gary under the guise of shooting an amateur documentary. While recording Gary, Jen accidentally backs into businessman Rich, who insults Jen after spilling his coffee. Incensed, Jen follows Rich to find out where he lives and later tells Fahrang she wants Rich to be their victim. Jen gradually grows more dominant as preparations continue. The couple visits Jen’s mother and retrieves an old camcorder and home movies of Jen as a child. Jen and Fahrang stakeout and trail Rich and discover he has a mistress named Christina. Following an argument, Fahrang tells Jen that he isn’t comfortable with killing Rich. Jen steals a neighbor’s cat and drowns it in the kitchen sink, which disturbs Fahrang. Jen returns to Gary and brings him home under the pretense of offering dinner. Fahrang is upset to discover Jen did not consult him first. Fahrang grows more irate after he finds that Jen drugged Gary and they must move ahead with the murder. Fahrang is forced to film while Jen strangles Gary to death. Afterward, Jen is exhilarated while Fahrang remains shocked. Fahrang films while Jen bleeds out Gary in the bathtub. Jen takes the camera after coercing Fahrang into sawing the body into pieces. After a brief interruption from the neighbor looking for her missing cat, Jen pulls out Gary’s teeth and blowtorches his fingertips. Together, the couple cleans the bathroom and then they bury the body parts in the woods. Fahrang becomes increasingly concerned when he sees Jen is still recording and their lives are not returning to normal even though the deed is done. Jen secretly resumes stalking Rich and when Fahrang discovers Jen is plotting another murder as well as surreptitiously filming him, he breaks the camera. Jen continues filming with her mother’s old camcorder. Using a taser, Jen kidnaps Rich and his mistress Christina and restrains them in the basement for torture. Jen kills Christina. Fahrang comes home to find Jen preparing to kill Rich. The couple argues and then struggles over a hammer until Jen accidentally hits herself in the head with a fatal blow. Panicking, Fahrang calls 911. Because Rich will not stop moaning from his injuries, Fahrang loses his temper and murders the man. Surrounded by the bodies of Jen and the two victims, Fahrang records a defeated message for the documentary’s final scene as sirens are heard and police arrive at the door. “Capture Kill Release” is almost as challenging to review as it can be to watch. The “found footage” film follows an outwardly normal couple documenting their first tandem thrill kill from conception to aftermath. Its home movie feel and unflinching violence sometimes seem so authentic that unprepared audiences may have no choice but to turn away. Fairly evaluating such an unsettling experience becomes difficult because what equals artistic success to some can be booed as an entertainment failure by others. Jen and Fahrang want to put some spring in their marriage’s step. And their highly unconventional idea for doing so involves homicide. With a camera perpetually in hand to record every step from supply shopping to stalking to strangulation, Jen’s giddy enthusiasm to do this dark deed turns ghoulish as Fahrang’s toes start tingling from frostbite. This sociopathic journey is going to change Jen, Fahrang, and their relationship in ways neither of them fully considered. Jen and Fahrang are most certainly not Mickey and Mallory, which is what makes their bizarre bond so fascinating. They are a cute couple with the right chemistry to appear average on the outside, like the woman hitting up Jamba Juice on her way home from yoga or the property manager who showed you that house last weekend. Yet mild childhood trauma, boredom from privileged lifestyles, and blind romance warping gears on the inside have concocted a cocktail anxious to unhinge their grasp on reality. Some might think it a stretch for such suburbanites to make a major leap into murder instead of marital aids as a means to amp themselves up. I’m merely reminded of viral videos where a nondescript woman rants at the staff of a craft store or coffee shop for misperceived mistreatment. These are precisely the personalities who function fine in society without suspicion under normal circumstances, but look out when unstable fantasies overwhelmingly poison formerly rational minds. Jennifer Fraser is completely confident as Jen. It’s a legitimate shock that “Capture Kill Release” is the only credit to her name. Farhang Ghajar (who can probably get work as a Lin-Manuel Miranda stand-in) is right there with Fraser as her same-named husband in terms of an equally on-point performance. Both actors are credited as co-writers, implying considerable improvisation. Yet they never stumble over each other or struggle for something to say. Together, they naturally create two completely believable beings who are just as believably engaged in an unbalanced relationship. One grows gradually more dominant while the other reticently regresses into submissiveness, and their seesaw of power is intriguing to see unfold. “Capture Kill Release” doesn’t so much profile a descent into madness as it does the fracturing of a flawed marriage that happens to be framed around murder. Fraser occasionally peaks into the red on the ‘overplay’ meter, in particular with some exuberant exhilaration following the (first) main event. Fraser demonstrates an ability to hit precise notes across the range she explores, though there are these moments when her mood isn’t reined in quite right, which I attribute to a momentary mistune from co-directors Nick McAnulty and Brian Allan Stewart. Nevertheless, Fraser and Ghajar both perform consistently above the average expectation bar for a microbudget “found footage” film. And McAnulty’s instinct to recast with this couple after shooting a quarter portion of the movie with a different pair was clearly the correct move to make. The main issue many will have regards the film’s relative brutality, which isn’t excessively exploitive, but is graphically intense. 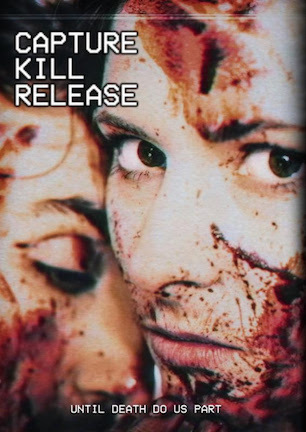 Whether intentionally or unintentionally, at least “Capture Kill Release” doesn’t approach “Henry: Portrait of a Serial Killer” levels of realism with its first-person format. The relationship drama reads as much more realistic than the violence does. “Capture Kill Release” is more viscerally gruesome than emotionally dark. For example, an arm sawn off in close-up can be controversial out of context, though as a makeup effect it is outstandingly impressive. The main issue I have with the movie is it should run closer to 75-80 minutes rather than the 96 composing its actual runtime. If only this were true. Scenes of handcuff escape practice, trailing targets, and measuring bathtub dimensions are essential to some degree. Except “Capture Kill Release” doesn’t need all of the how-to exposition it goes into for much of the movie. There’s a point in the buildup where “just get to it already!” becomes a predominant thought, which is not the right gear to be in for setting up suspense. I think potential boredom is a harder hill to climb than potential revulsion with “Capture Kill Release.” Its spotlight on irredeemable people also alienates an emotional tie to the fiction, though terrific performances ground real evil into next-door neighbor characterizations. And that is a truly terrifying portrait to examine. February 17, 2017 by Ian Sedensky.